Members of a South Texas mosque that was set ablaze last year went up to shake hands and hug prosecutors in a federal courtroom Monday. Just moments before,12 jurors had announced they’d found the man accused of setting the fire guilty. “Yes,” each said when asked one by one if that was their true verdict. The trial of Marq Vincent Perez, who was indicted last year of a hate crime related to the Jan. 28, 2017 fire at the Victoria Islamic Center, began last week at the federal courthouse. It took the jury about three hours of deliberations before finding him guilty of three felony counts including damage to a religious property, use of fire to commit a federal felony and possession of a destructive device related to an earlier incident. 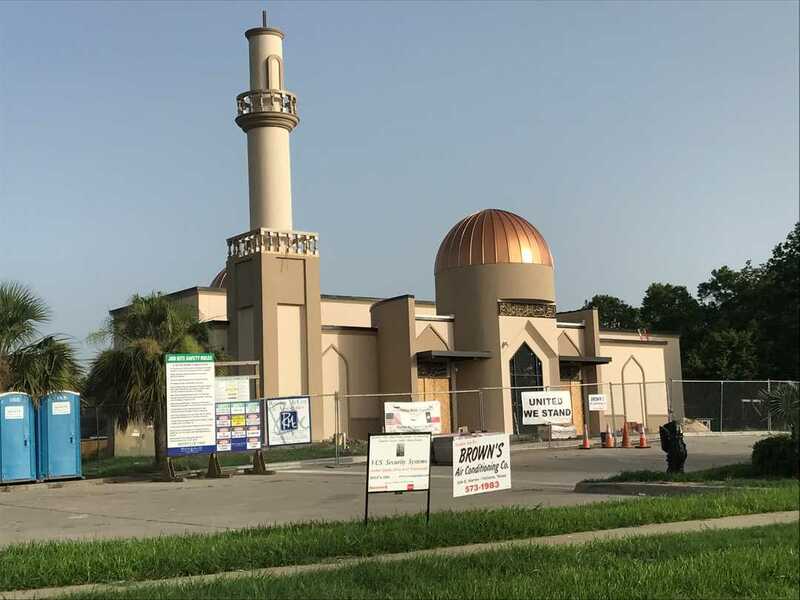 Construction on the new mosque is about 80-85 percent complete. “No group anywhere in the United States of America should be subjected to such hate crimes,” said Omar Rachid, who handles community and public relations for the mosque. “I think what the jury has done today, this afternoon, is send a message loud and clear that such behavior and such crimes will not be tolerated,” he continued. 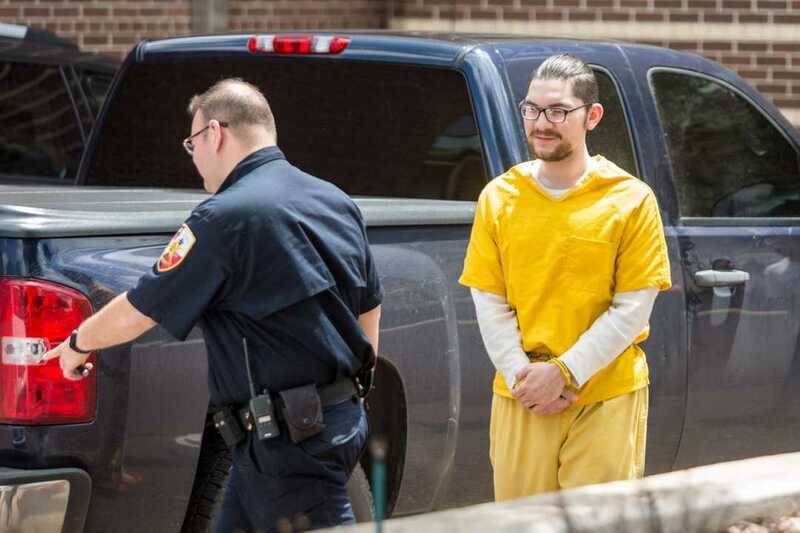 U.S. District Judge John D. Rainey will decide Perez’s sentence at an Oct. 2 hearing. The date could coincide with the opening of the newly built mosque. “God works in mysterious ways, and maybe one of those ways he has in store for us is that the sentencing could very well take place at about the time we take possession of our new mosque,” Rachid said. Perez, wearing a grey shirt and dark rimmed glasses, sat beside his attorney Mark Di Carlo Monday as federal prosecutors presented their closing arguments to a jury. His trial was expected to last around two weeks, but the presentation of evidence concluded Friday. A video clip of the burning mosque played on a large screen in the courtroom as prosecutor Saeed Ahmed Mody began presenting his case. “His intention was for damage and destruction, and that’s exactly what he did,” Mody said. Marq Vincent Perez, 26, is escorted from the Martin Luther King Jr. Federal Building after a pretrial hearing. Perez, of Victoria, is accused of intentionally setting a fire that destroyed a mosque at the Islamic Center of Victoria in January 2017. He argued it was Perez’s goal to “terrorize” the Muslim community. He described the Victoria Islamic Center as a place where the community would gather for joyous occasions — weddings and weekly potlucks — as well as sad occasions. On Jan. 15 Perez went on a “training mission” to throw an “improvised bomb” into a car, he said. After burglarizing the mosque with a juvenile identified as K.R. on Jan. 22, the two returned on Jan. 28 but this time, Perez set the mosque on fire, Khandelwal argued last week. 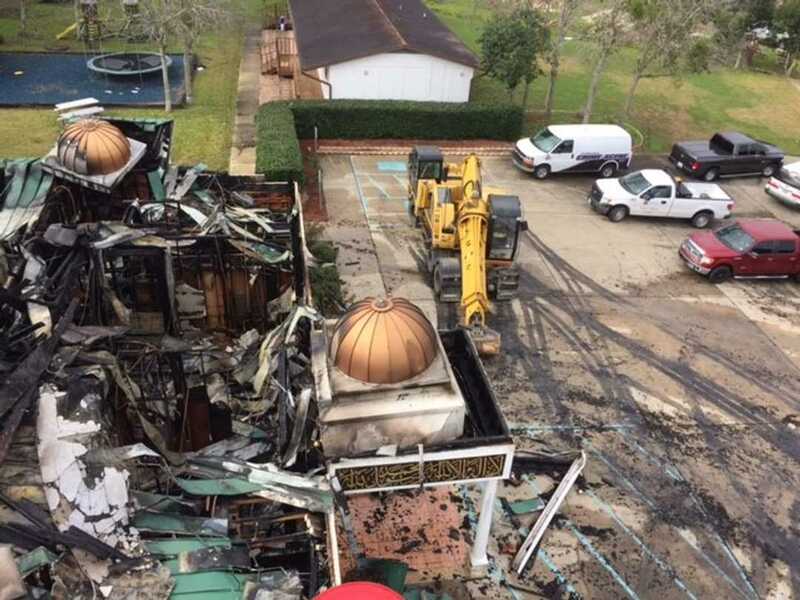 Authorities have determined arson is responsible for the fire that destroyed the Victoria Islamic Center mosque on Jan. 28, 2017. But during his closing arguments, Di Carlo maintained his client’s innocence. He told jurors that the juveline’s testimony is hearsay and promoted the idea that he was not a credible witness. The jury was shown Facebook messages that prosecutors say show Perez’s hate of Muslims. “He can’t keep his mouth shut and he can’t keep his fingers off the laptop either,” Khandelwal said. The jury also listened to testimony that showed Perez’s phone contained photos of the burning mosque and that items that were stolen from the mosque were found at Perez’s residence, according to prosecutors. Di Carlo said the government “cherry picked and oh so carefully presented” their evidence against Perez. “We only have what the government allowed us to see,” Di Carlo said. He also suggested that Perez was “profiled” because he’s conservative, had a brief stint in the military and was allegedly a part of the militia group. Di Carlo flipped through a copy of the Quran that had been admitted into evidence. “And do not cover the truth with falsehood,” he read, asking the jury to find Perez not guilty. Di Carlo said he was surprised by the jury’s decision. U.S. Attorney Ryan Patrick lauded the conviction as a commitment to protect religious liberty. Perez faces up to 20 years in federal prison for the hate crime count and up to 10 years for possessing an unregistered destructive device, according to the U.S. Attorney’s Office. For use of a fire to commit a felony, the penalty is consecutive and he faces a mandatory minimum of 10 years in prison. Each count carries a possible $250,000 fine. And as Perez awaits a decision on how long he’ll be behind bars, members of the mosque are looking forward to opening the doors of their new mosque. Construction is about 80-85 percent done. They are hoping to have it opened in September or early October, Rachid said. One of the Victoria Islamic Center board members said despite the fire, they want the mosque to be a place that his open to the community. “The last thing we want to do is for evil to win by making us … be separated from our community,” Abe Ajrami said. He extended thoughts and prayers to Perez, adding that maybe Perez can use his time in jail to learn about Islam. He also extended prayers to Perez’s family. At the end of the day, what’s more important than the verdict is how the community came together following the fire, Ajrami said.